http://www.jewishworldreview.com | As the great comedian, Jimmy Durante used to say "Everybody wants ta geddin ta de act!" These days it seems like non-Jews all over the place are trying to take a piece of Jewish learning or history and make it their own. The problem is that in a lot of cases they are copying Jews who just don't understand the Torah foundation supporting the traditions; like the "Faux Mitzvah", a party for 13 year old Gentile children, that skips the mitzvah part, or in some cases are being duped; like Hollywood's Kabbalah fad which turn sacred texts into nothing more than red string bracelets and "holy water". There are those of the Jewish faith who will tell you that this quasi-Jewish observance is dangerous. That it is trends that at best causes horrible confusion about Judaism and Jewish values, or even worse accelerate assimilation. Some even call it blasphemy. The more I think about it, the more I realize that this trend toward pseudo-Judaism may actually be a good thing. I will go so far as suggesting that Jews should be encouraging these practices  with one quid pro quo. If people want to pick up Jewish traditions without Torah learning or observance  let them pick up the blame. You know what I am talking about  the Malaysian Prime Minister/ Pat Buchanan libel kind of blame. See how it could help? Take for example the Hollywood Kabbalah cult. Now I was always taught that Kabbalah was advanced Jewish study, before I could truly understand what it was all about, I would have to know Torah backward and forward. Yet the Hollywood Cult went strait to the Zohar (the sacred text that teaches Kabbalah). I say let them. 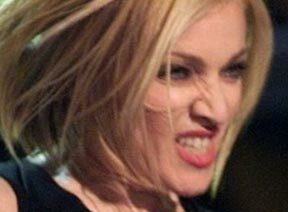 But before Madonna, I mean "Esther", straps on her Tefillin, douses herself with Kabbalah water, or makes another music video singing about Kaballah while acting, ahem, inappropriately with another woman, she has to have a little press conference. She has to tell the press that it is she that controls the media. It's a believable concept. Let's face it anybody who has seen some of her last few movies will believe that she had to have some degree of control to get them made. Or take Madonna's Kabbalah prot�g�e, Brittany Spears. Brittany has recently announced that she has given up Jell-O because it's not Kosher. And keeping Kosher has made her so healthy. She also announced that she has tattooed one of the 72 names of G-d on the nape of her neck. Two bads: Tattooed and G-d's name in vain �I wonder if they work like a double negative  becoming a positive. Well I suggest we call it that, but first we make Brittany call up Fritz Hollings and Pat Buchanan, and she has to convince them that the war in Iraq is being waged so that Bush will get the teenybopper vote. Lavish Parties do not make a B'nai Mitzvah crass. Crassness enters the picture when the child and their family forget what the party is celebrating; a level of Torah learning, the child accepting the gift of Torah responsibility. By its definition the "Faux-Mitzvah" is meant to be crass  big party  lavish gifts no Torah responsibility  no mitzvah. These crass parties can be a good thing as long as each invitation mentions that this party can only be afforded because it is the pseudo-Jews that control the banks. The shifting of some Anti-Semitic libel can even help with the Middle East peace process. For years the Palestinians have been trying their darnedest to de-legitimize Jewish historical claims to the holy land. They even say that there was never a Jewish Temple on the Temple Mount. I think that as part of any peace deal, we should let the Palestinians claim the mount, but first they have to call up Mel Gibson and his father and explain that 2,000 years ago it was the Palestinians that killed Jesus. Of course they might refuse�denying that libel, instead they might want to explain the historical fact that there were no Palestinians around 2000 years ago. Come to think of it, that wouldn�t be a bad thing, either.